Rashtriya Chemicals and Fertilizers Come out with the RCF Operator Trainee Recruitment 2019 Of 50 Operator Trainee Posts which is advertised recently at www.rcfltd.com and is offering a total of Operator Trainee posts containing 50 Vacancies and aspirants can apply for this RCF Recruitment 2018 Of Operator Trainee until 10th April 2019. 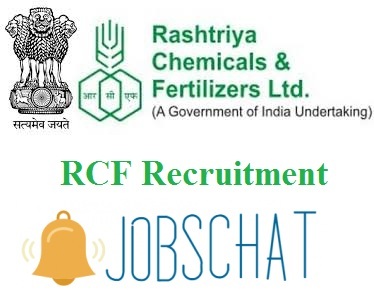 Rashtriya Chemicals and Fertilizers, which is one of the Government Undertaking Board Offering the RCF Recruitment 2019 For Operator Trainee Jobs containing 50 Posts. Residents of India irrespective of Freshers/ Experience may Open the RCF Operator Trainee Job Notification and find out the candidature employability for the Operator Trainee Posts. As the Qualification for the Degree in Chemistry, the candidates only completed to this Qualification may fastly Apply for this Rashtriya Chemicals and Fertilizers Operator Recruitment 2019 until 10.04.2019 and start the groundwork for Written Test with the help of Syllabus and Previous Papers. Candidates should have the Following qualifications as the Desired ones for the 50 RCF Operator Trainee Job Openings. Contenders must possess the Lower And Upper Age Limits of 18 and 27 Years as on date 01st February 2019 and there is an Upper Age Relaxation of 05 Years for SC/ ST Contenders and 03 Years for OBC Contenders. The Registration Fee which is non-refundable must be paid by the Applicants in Online mode only. For SC/ST/ PWBD: NO fee. RCF Board should select the Candidates only through the Rounds of selection which are nothing but. Rashtriya Chemicals and Fertilizers Offers the Salary as given below. RCF Management Trainee Notification @ www.rcfltd.com: Maharashtra Government has offered the good employment opportunities for Both freshers and Experienced candidates in both Chemical & Fertilizers fields. This is a good chance for the interested and willing candidates to get a job in RCF as a Management Trainee Posts which are organized by the Maharashtra state government officials. There are total 35 Vacancies offered by the Rashtriya Chemicals and Fertilizers limited Company. RCF Recruitment Online Application starts from may 17th May 2018 and end date will be 12th June 2018. To know more details about our page, Stay connected to our website jobschat.in. Details of RCF Management Trainee Application: Our website page, will give the necessary steps to download the application form links below. Follow the steps then you can easily get the direct application form links. 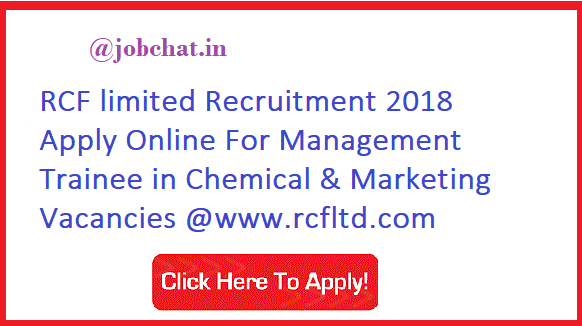 Management Trainee in Chemical & Marketing for RCF Vacancies gives the future scope if the candidate gets a job in those vacancies, they can get the better salary with more opportunities. For Management Trainee in chemical Qualification which is needed the Full-time course of BE / B.Tech / B.Sc Engg. (Engineering Graduate) in Chemical discipline from a recognized university. For Management Trainee in Marketing Qualification needed is the Full- time B.Sc. (Agriculture) plus UGC recognized two years’ full-time MMS/ MBA. Check your Eligibility criteria then only move on to fill the application forms. Check RCF Recruitment 2018 Notification: While applying for these vacancies, read out the notification carefully and then start to apply online for this job. Because Applied candidates can be shortlisted based on their GATE score. If the candidate qualifies for the GATE Examination, they only have the eligibility to apply. Not only that, But also Maharastra government has given the age limit for this recruitment. Upper age limit candidates are not able to apply for this RCF Vacancies @ www.rcfltd.com. To get more employment news about Maharashtra state govt, follow our website page for more information. @ www.rcfltd.com RCF MT Application Through GATE: For that, our website page provides the previous papers link, which is useful for the candidates to solve questions in an easy manner. Then only pay the application fee after successfully filling of application form. So that they can manage time while attending the exam. Previous papers for RCF Management Trainee Recruitment having all the information about the contents that is based on Management Trainee in Chemical & Marketing. While filling applications, candidates upload all the correct documents, photographs and signature with essential documents. Previous papers help the candidates to score good marks in the written exam process. What are education qualifications required for RCF MT through GATE? For Management trainee in chemical: Full-time course of BE / B.Tech / B.Sc Engg. (Engineering Graduate) in Chemical discipline from a recognized university. For Management trainee in Marketing: Full- time B.Sc. (Agriculture) plus UGC recognized two years’ full-time MMS/ MBA. What is the age limit for Rashtriya Chemicals and Fertilizers Notification? 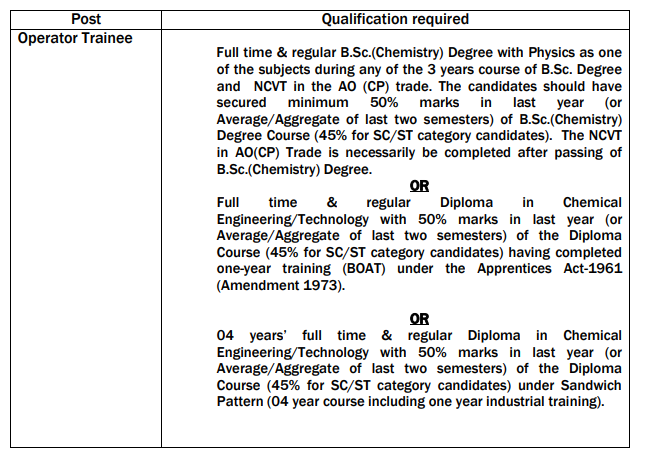 What about the vacancy details of RCF Management Trainee Posts? For Management Trainee in Chemical: 15 posts. For Management Trainee in Marketing: 10 posts. What type of selection process id done for RCF through GATE Recruitment? Personal interview or document verification process. Is there any application fee for this RCF Management Trainee Notification? First, visit the application form @ www.rcfltd.com. select the Home page on that website. Check for the category for the post, the candidate is applied for the fields. Read the instructions on the RCF Recruitment application form. If you are eligible, fill the application. Upload all the essential documents in the application form. Check all the details before submitting. After submitting, pay the application fee based on candidate category. Application Start Date: May 17th, 2018. Application End Date: 12th June 2018.